Vault Boy approved! Celebrate the hit video game Fallout with this exciting magnet set. 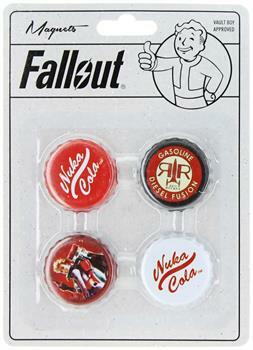 Set includes four (4) magnets: two Nuka-Cola bottle cap logos, the Nuka-Cola space girl mascot, and a magnet for Gasoline Diesel Fusion. Perfect to stick on any flat metal surface! Officially licensed.